The last of the projects this week with my new stamp set. Don't forget to enter the giveaway for this set by Sunday evening! 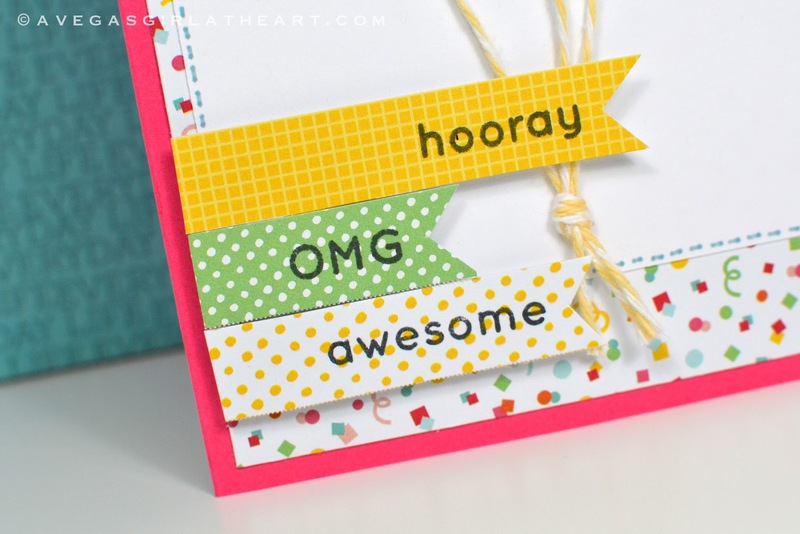 I love all the little words in the stamp set, because I knew I could use them for a variety of things. I was most excited to try making cards with them. The words are so fun, and just perfect for this birthday card I made for my friend SarahBeth's daughter's 3rd birthday party next weekend. I made the card using papers from the American Crafts Hip Hip Hooray Paper Pad, which I bought at Target. It's a 6x6 pad with 36 bright and happy papers. The little banners I cut from the patterned strips at the top of each sheet of paper (the ones that hold the paper into the pad). They are perfect for small pennants! I just stamped words from my stamp set right onto the paper. The balloons are die cut using a Sizzix die I picked up ages ago. The '3' glitter thicker is from American Crafts Dear Lizzy. For the balloon strings I just tied some bakers twine around the balloons and pulled them down into a knot. Super cute! I promise, that's the last stamp project. I'm done flooding you with ideas, though you will probably see them again in future projects. Have a great weekend everyone! See you on Monday for my July freebie. Silhouette users, you are especially going to like this one. I posted a teeny tiny sneak peek here on my Instagram if you're curious.